Is Winter over yet? It’s April, and spring has finally sprung. We are sure that everyone is looking forward to sunshine and our famous 70 degree temps returning every day. Our 12th annual Online Auction was a huge success, raising over $85,000! Our deepest gratitude to our amazing chair, Allyson Watson, for her tireless work and dedication to our far-reaching and exciting auction. Once again, we had bidders from all over the nation!! Many thanks to the Watson family for allowing their home to become an auction warehouse for the past many months! Thank you to all of the families who donated items and hosted parties and to all of the teachers and staff who donated special experiences for our kids. The hosted parties raised over $18,000 and teacher and staff experiences raised over $12,000. Finally, thank you to everyone who bid and congratulations to all of the winners! Our West Valley Food Pantry drive was another great event this year. Thank you once again to Ben Abadian for organizing the food drive and being on the front line collecting the bags at drop-off every day of the week, not even a little rain on Wednesday could stop him. As a community, we donated so many bags of food (2,000 POUNDS!!!) that we filled two truckloads!! The pantry was overwhelmed by Chaparral’s generosity. Thank you to all of you who took time out of your busy lives to donate a bag of food to those less fortunate. Our spring line-up of humanitarian events organized by our Humanitarian Chair, Ben Abadian, continues with our upcoming Shoe and Clothing Drive April 24th -May 1st. Get your spring cleaning done and put aside your gently used items now!! Our line-up of wellness week events organized by our dedicated Wellness Chair, Maria Nicolacakis, and her team kicks off with the ever popular Hoop-It-Up assembly on April 25th and ends with the family friendly Farmer’s Market Jamboree on May 1st. 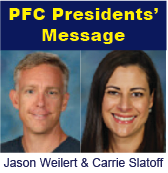 Finally, please join us at our newly named “PFC Meet and Greet: How Can I Get Involved?” Breakfast on Friday, May 3 at 8am in the MPR and learn about how you can get involved with the PFC. We look forward to seeing you all there! The monthly PFC meeting will follow.